Just like people, our dogs are as likely to develop fears and anxieties which cause us and them considerable distress and inconvenience. 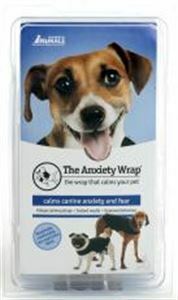 the anxiety wrap has been used by thousands of veterinarians, trainers and dog owners to reduce anxieties in dogs, including fear of other dogs and of people, fireworks, thunder storms, of travelling in a car or of being left alone. this simple technique of maintained pressure has been scientifically proven to calm animals in the same way as cuddling a distressed infant also relieves their fears. the key feature of the anxiety wrap and which is not found in other behavioural garment products for dogs is that its stretched elasticated material delivers sustained pressure to key acupuncture points on the dog?s body, which in turn builds up their confidence. the end result is that you will have a dog who can better cope with stress, resolve irrational or excessive fears and bring peace to his troubled mind.